The University of New England has announced that its 2016 Commencement speaker will be Dr. Robert Michael Franklin Jr., who is currently the James T. and Berta R. Laney Professor of Moral Leadership at Emory University (Atlanta) and director of the Religion Department of the Chautauqua Institution. The UNE ceremony will be held on May 21 at 10 a.m. in the Cross Insurance Arena at one Civic Center Square in Portland, Maine. In 2014, Franklin served as senior advisor for Community and Diversity, Emory University (Atlanta). In 2013, he was a visiting scholar in residence at Stanford University’s Martin Luther King, Jr. Research and Education Institute. He is president emeritus of Morehouse College, where he served as the tenth president of the nation’s largest private, four-year liberal arts college for men from 2007 through 2012. Franklin graduated Phi Beta Kappa from Morehouse in 1975 with a degree in political science and religion and holds ordination in two Christian denominations: the American Baptist Churches USA and the Church of God in Christ. Franklin earned the master of divinity degree in Christian social ethics and pastoral care in 1978 at the Harvard Divinity School, where he also served as assistant director of Ministry Education. Other pastoral positions include assistant pastor at St. Paul Church of God in Christ in Chicago and Protestant chaplain at St. Bernard Hospital, also in Chicago. Franklin continued his education at the University of Chicago, earning a doctorate in ethics and society, and religion and the social sciences in 1985. He also undertook international study at the University of Durham, U.K., as a 1973 English Speaking Union Scholar. His major fields of study include social ethics, psychology and African American religion. He is also the recipient of honorary degrees from Bethune Cookman University, Bates College and Swarthmore College. An insightful educator, Franklin has served on the faculties of the University of Chicago, Harvard Divinity School, Colgate-Rochester Divinity School and at Emory University's Candler School of Theology, where he gained a national reputation as director of Black Church Studies. He also has served as program officer in Human Rights and Social Justice at the Ford Foundation and as an adviser to the foundation’s president on future funding for religion and public life initiatives. In addition, Franklin was invited by American film producer Jeffrey Katzenberg to prepare an online study guide for the congregational use of "The Prince of Egypt," a DreamWorks film (1999). He also served as an advisor to the History Channel’s presentation titled "The Bible” (2013). Franklin provides commentary for the National Public Radio (NPR) program “All Things Considered” and weekly commentary for Atlanta Interfaith Broadcasting Television. He is also the author of three books: "Crisis in the Village: Restoring Hope in African American Communities" (2007); "Another Day’s Journey: Black Churches Confronting the American Crisis" (1997); and "Liberating Visions: Human Fulfillment and Social Justice in African American Thought" (1990). He has co-authored (with Don S. Browning, et. al.) a volume titled, "From Culture Wars to Common Ground: Religion and the American Family Debate" (2001). He also penned the foreword to Dr. Martin Luther King Jr.’s, Letter from Birmingham Jail, reprinted by Trinity Forum in 2012. Active in a range of organizations, Franklin serves on the boards of the Salvation Army, the CNN Dialogues Advisory Committee and NASA’s 100-year Starship Project Advisory Board directed by former astronaut Dr. Mae Jemison. He is a member of the Council on Foreign Relations and Sigma Pi Phi Fraternity (Kappa Boule). He is a member of the Atlanta Falcons Advisory Board; Atlanta Rotary Club; 100 Black Men of Atlanta; the 1999 class of Leadership Atlanta; the Leadership and Sustainability Institute Working Group (of the Open Society Foundation); and Alpha Phi Alpha Fraternity, Inc. 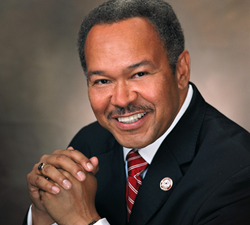 He has served on the boards of the Atlanta Regional Council for Higher Education (ARCHE); the Metro Atlanta Chamber of Commerce; the Atlanta Symphony Orchestra (executive committee); the White House HBCU Capital Financing Advisory Board; the Atlanta Business League; and the Atlanta Mayoral Board of Service. Previously, he served on the boards of the Joint Center for Political and Economic Studies, Public Broadcasting of Atlanta, and Atlanta Interfaith Broadcasting. In 2000, Mayor Bill Campbell appointed him co-chair of Atlanta 2000, the city’s official coordinating committee for Y2K activities and celebrations. A seasoned traveler, Franklin has studied seven languages and visited Africa, Asia, Europe, the Middle East and the Caribbean. He is the recipient of a Ford Foundation grant to examine religion in public life in Asia and produced NPR commentaries based on this research. He has also served as a consultant for the Annie E. Casey Foundation’s work on alleviating poverty and strengthening fragile families. The University of New England (UNE) is Maine’s largest private university. It offers dozens of undergraduate, graduate and professional degree programs and is home to Maine’s only medical and dental schools. With coastal campuses in Portland and Biddeford, Maine, and one in Tangier, Morocco, UNE attracts internationally recognized scholars in the sciences, health, medicine and the humanities. It is one of a select group of academic institutions with a comprehensive health education mission that includes programs in medicine, pharmacy, dental medicine, nursing and an array of allied health professions. Visit http://www.une.edu. innovation for a healthier planet.